Zlotnikov K. M., Pustovoitova T. N., Zlotnikov A. K. (2000) Metabolites of Pseudomonas aureofaciens H16 and Bacillus megaterium PC2 increase drought resistance of spring wheat. In: Kulaev I. S. (Ed.) Modern problems of microbial biochemistry and biotechnology. Abstr. Int. Symp., Puschino, June 25-30, 2000. IBPM. Puschino. p. 138-139. Zlotnikov A.K. Application of Albit for the improvement of resistance of plants to drought and other stresses / A.K. Zlotnikov, K.M. Zlotnikov // Agro XXI.- 2007.-№ 10-12.-p.37-38 (Rus). Drought is one of the main problems the modern agriculture facing with. It is calculated that drought and desertification lead to world annual agricultural losses of 42 billions dollars. Past 1998, 2000, 2001, 2002, 2003, 2010 and 2012 years were droughty for all agricultural regions of Russia or for part of them. Total losses due to drought and other natural disasters only in 2000 in Russia made up 20 billions rubles. According to scientists’ predictions, global warming will lead not only to temperature growth, but also to increasing of temperature fluctuations and increase of number of extremely cold and hot (drought) summers. One of the most effective directions of protective sowings against drought is increase natural drought resistance of plants. Together with breeding of new drought resistance varieties of plants, also role of biostimulants is important (enhancers of drought resistance). Range of this biostimulants is only beginning to appear in market. Leading chemical companies design this biostimulants. Albit became the first biostimulant, which officially recommended for increase of drought resistance of field crops (List of pesticides …, 2008). Director of VNII National Institute of Biological Plant Protection, member of the Academy, V.D. Nadykta noted: «Albit is the only biostimulant helping farmers of Krasnodar krai effective control weeds». In average, based on integral parameters, Albit increases drought resistance of plants by 10-60 %. The most clearly the effect of Albit on drought resistance of plants is detected on olive trees. When growing on boghara, olive trees are constantly in conditions of severe drought. Spraying with Albit helps plants to retain moisture and form a good yield (Fig. 1). The yield increase is several tens of percent. The efficiency of soil moisture consumption by spring wheat breed Prohorovka was evaluated during the field trials which were held at the Ogarev’s State University, Mordovia in 2006-2008 (Kargin V.I., How to improve the efficiency of soil moisture utilization / V.I. Kargin, A.A. Erofeev, D.N. Govorov, R.A.Zaharkina, U.I. Kargin // Plant Protection and Quarantine.-2011.-7.-P.45-47 (Rus)). The trials were carried out in combination with different methods of soil treatment (without any treatment, conventional tillage, harrowing, disking, etc.) (Fig. 2). On average, for the formation of 1 ton of grain 78.3 mm of water was spent (without chemical pesticides application) and 58.4 mm (in variations where chemical pesticides were applied). Application of Albit (pre-sowing treatment 30 ml/t) reduces the amount of water necessary for the formation of a ton of grain, by 8.8 and 5.1 mm, respectively (11.3% and 8.7% to control). The maximal water rate was at zero tillage (no-till), and in this case Albit significantly reduced the water consumption (Fig. 2). Influence of Albit on drought resistance of plants was examined in details in pot experiments with spring wheat performed in Institute of Plant Physiology RAS. Drought is a complex phenomenon, which includes moisture deficiency and increased temperature of environment. Ability of plants to resist high temperatures was examined according to heat resistance index; drought resistance was examined according to water retention capacity, water content in leaves and transpiration intensity). Application of Albit reliably increased all the listed characteristics, except for transpiration intensity. Results of trials are summarized in Table 1. Treatment with Albit increased the ability of plants to resist high temperature under drought conditions. So, application of Albit increased heat resistance of wheat under conditions of drought and watering up to 134-160% (100% - untreated control) and 107-153%, respectively. With the lapse of time hot resistance of Albit treated plants increased even more. Treatment with Albit also lead to more efficient water consumption of plants: intensity of transpiration of Albit-treated plants decreased more than twice, from 453 to 203 mg of water/g of biomass in one hour under watering, and from 247 to 171 mg of water/g of biomass in one hour under drought conditions. As it was found in trials, ability of Albit to provide high yields under drought conditions depends on both activation of plant’s biochemical mechanisms of drought resistance (hot resistance, water retention ability) and improvement of rootage. Albit increased rooting, the formation of additional secondary roots, resulting in increased resistance to drought. According to foreign scientists (Faculty of Agriculture, University of Abuja, 2010), field germination of corn seeds in the semi-desert zone of Nigeria (South Sahara) as a result of treatment with Albit increased from 83.3 to 90.0%, the mass of the root system increased by 17,5%, total plant health index increased by 63.3%. 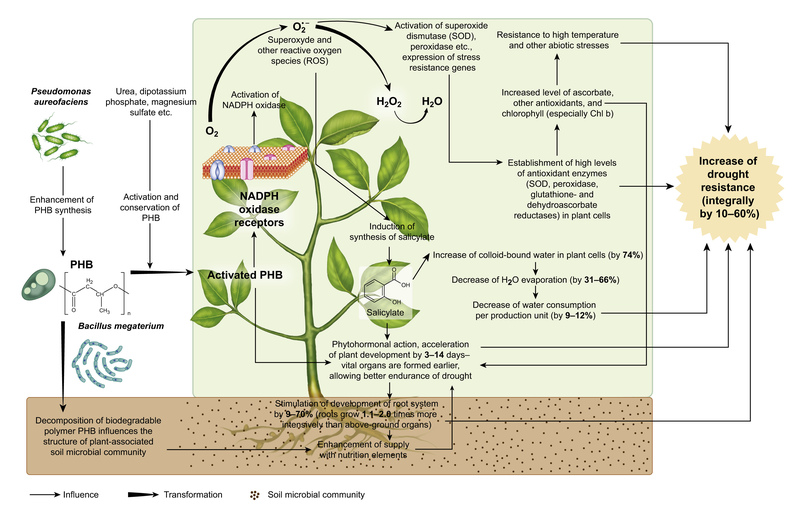 The above mentioned mechanisms of influence of Albit on drought resistance of plants are summarized in the principal scheme (Fig. 3). Ability of Albit to increase drought resistance of plants was confirmed in practice on different agricultures (cereals, sugar beet, sunflower, vegetables). Due to this feature, Albit provides considerable yield increase even under conditions of drought and high temperature, when effect of other chemical and biological products becomes negligible. It was demonstrated in tests of Kurgan Institute of Grain Growing (1998), All-Russia Institute of Agrochemistry (1997-1998), Tuva Regional Plant Protection Station (2001) and others, carried out in different regions of Russia where drought is common (forest-steppe zone of Siberia) and in other regions in drought years. The activity of Albit was clearly manifested under the catastrophic conditions of heat and drought in 2010. In field trials of Ryazan Agricultural Research Institute, winter wheat spraying with Albit increased grain yield by 18% (with an average long-term raise for this culture of 13%). Pre-planting treatment of potato tubers with Albit led to earlier (for 7 days) germination and yield increase in yield by 74% ( from 73.5 to 128 centners/ha). In extreme conditions of 2010 vegetation season, Albit allowed to get economically important crop yield in the European part of Russia. The application of Albit together with chemical pesticides allowed to obtain the maximum yield of barley 73 centner/ha, winter wheat 59 c/ha, winter rye 36 c/ha at "Kuteminskaya Agrofirm", Tatarstan under extremely hot and dry conditions (air temperature +33 ... +35 °C, the soil temperature up to 75 °C, no precipitation since March). The difference with the control variant (without Albit) reached to 12 c/ha. The increase of pea yield was 43% (5.1 c/ha). A similar peak drought has been registered in Western Siberia in 2012. Pre-sowing seed’ treatment of spring wheat with Albit provided yield increase of 66% (from 9 to 15 c/ha) in Teterin’s farm (Kozhevnikovsky rayon, Tomsk oblast) under the described abnormal conditions. Earlier, under the drought conditions of 2003 Albit improved drought resistance of plants, and thus high yields of grain (50-70 centner/ha) were obtained at the farms of Krasnodar kraj. This crop yield was at the level of non- droughty 2002 season. According to data of Kurgan Research Institute of Grain Growing, even in extremely drought summer of 1998, Albit treatment provided spring wheat yield increase of 2.3 c/ha (19.8%), whereas treatment with chemical seed treatment agent based on a.i. tiabendazole and flutriafol did not give any effect. Analogously in trials of Kurgan Regional Plant Protection Station (2000) in farm Lebyazhevskoe, the biological efficacy of Albit against root rots of wheat was 83% and yield increase was 2 c/ha (16.7%) despite extremely adverse conditions (slow and cold spring, hot and drought first half of summer). Joint trial of Buryatia Regional Plant Protection Station and Buryatia Institute of Agriculture (2003) on spring wheat var. Selenga was performed almost under the same conditions (slow spring with returning cold, drought, etc.). In result of trial, biological efficiency of Albit (30 ml/t of seeds) against root rots was 65% and yield increased by 15.6% (i.e. 1 c/ha; yield in control – 6.4 c/ha). In trials of Penza regional plant protection station on spring wheat and barley (1998), there were no precipitations for two months - from sowing till EC stage 71-72 while the temperature was 30-32°C. But anyway, Albit-treated plants (comparing to control set) had more intensive coloration, higher stem density and no cases of ear emptiness. Under drought conditions of Stavropol region, farmers (farms Bryzgalin, Uvarov, Khizhnyak) have been harvesting stably 5-8 c/ha increased yield during 3 years due to application of Albit. In trials of All-Russia Institute of Agrochemistry and Ryazan Regional Plant Protection Station, Albit presowing treatment of spring wheat provided the average yield increase of 23.8% in dry 1998, and only 13.6% in normal 1997. In further trials in different regions of Russia, it was found that besides drought and high temperature resistance, Albit also improves resistance to other stresses (temperature changes, cooling, overmoistening, chemical stresses caused by pesticides, etc.). Thus, increase of drought resistance is a particular case of antistress activity of Albit. In medical terms, stress is the disruption of homeostasis through physical or psychological stimuli. Under influence of different adverse factors, organism responds with similar biochemical changes directed to overcoming of these factors through appropriate adaptation. The term 'stress' in this context was coined by Austro-Canadian endocrinologist Hans Selye in 1936 with regard to humans and animals, but now it is being used more widely with regard to animals, plants, microorganisms and ecosystems. Factors inflicted stress were called ‘stressors’. Albit helps plants to adapt to adverse environmental conditions, therefore it may be called adaptogen or antistressor. Especially pronounced antistress activity of Albit can be seen at foliar spraying of winter cereals in EC stages 20-29 (tillering). Plants weakened by winter, herbicides and root rots respond to Albit with dramatic yield increase (up to 10 c/ha under field conditions). One important fact testifying to adaptogenic activity of Albit with regard to wide spectrum of stress factors is high reproducibility of its action under different conditions. Antistress activity is one of the most important properties of the biostimulant, therefore Albit may be considered antistressor as well as plant growth regulator and immunizer.